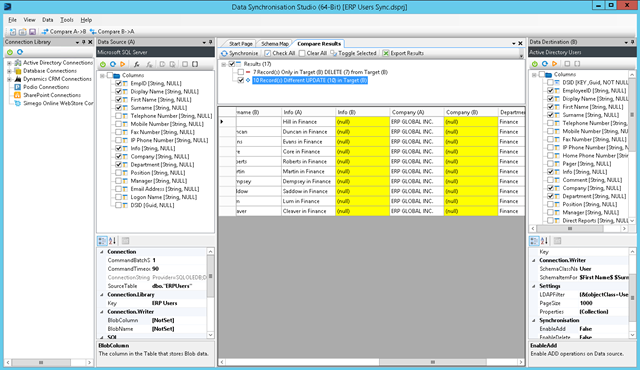 In this example we are going to use a MS SQL table called ERPUsers but this could easily be any of the extensive list of DS3 connectors. Information about employees always resides in at least two places. In the Human Resources (Capital) application (or ERP) and in the company's Active Directory. Often it is necessary to update data in the company's Active Directory to reflect changes or structural updates to reflect the HR application. Using DS3 you can automate this process and reduce expensive and error prone rekeying as well as reducing the amount of individuals with access to the Active Directory and Human Resources applications. 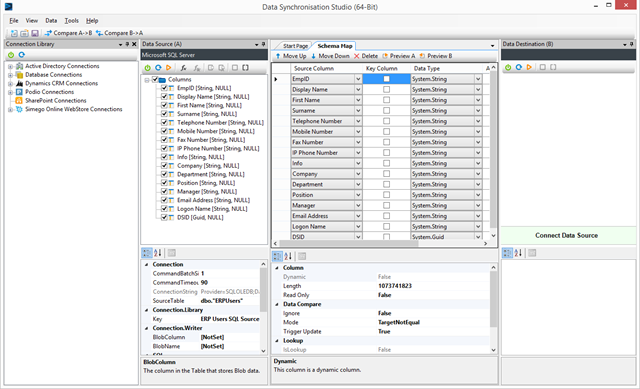 Click on the Connect to Data Source on the left hand side (Data Source A). 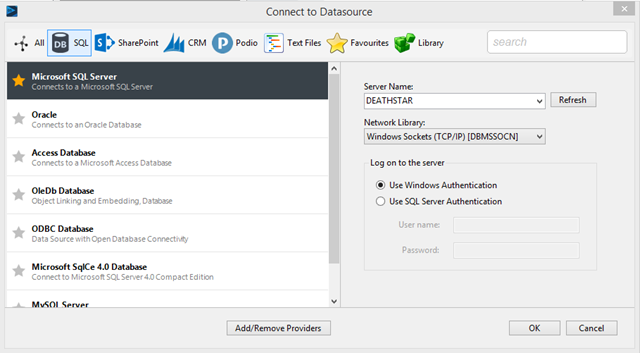 Select 'Microsoft SQL Server' as the source provider. 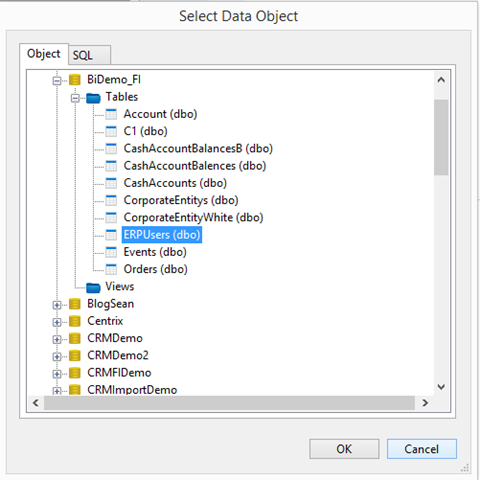 Complete the details, selecting the database and SQL Table (this could be a view or a SQL statement). 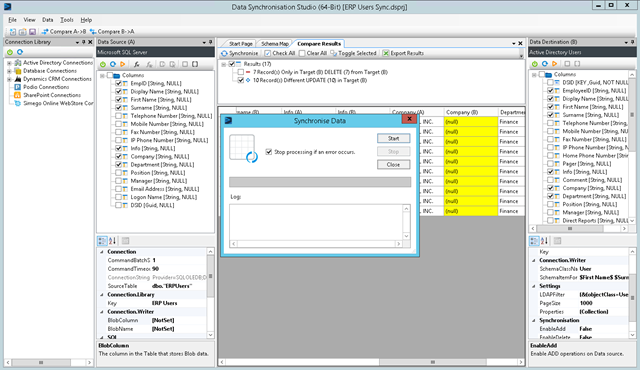 Once complete DS3 will offer to remember the connection in its connecting library, save it as 'ERP Users SQL Source'. In addition DS3 extract the tables' schema and display it on the left to assist mapping. Click on the Connect to Data Source on the right hand side (Data Source B). Select the Active Directory Users provider. Remember to complete you Active Directory Path correctly. In our case it is DC=Dev,dc=dom. 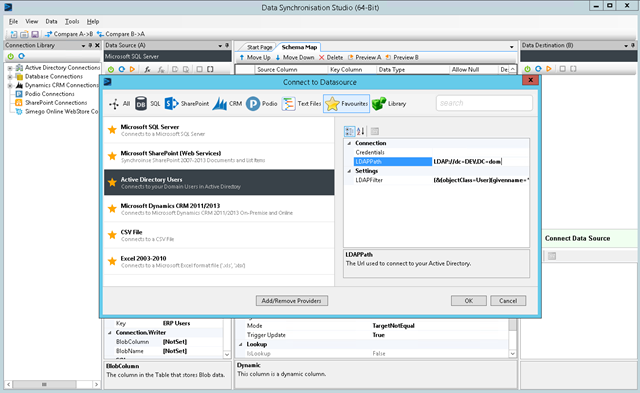 After completing the provider details save the connection in the library and click OK. DS3 will map any columns automatically that have the same name. 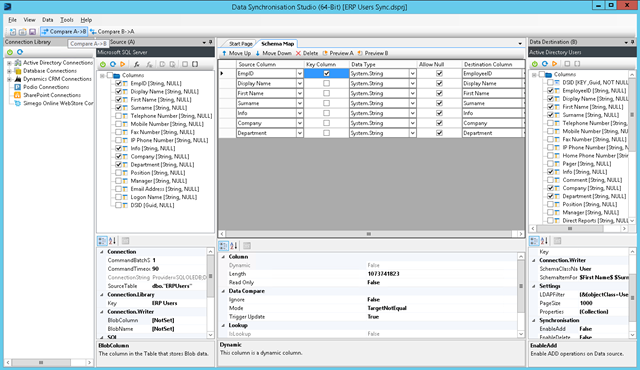 Choose a Key (Click on the tick box in the key column) so that DS3 can identify the same employee in the source ERP system and the target Active Directory. In this case we are mapping EMPID to EmployeeID. We have also removed all attributes we so not want mapped. To map attributes you can drag and drop them from either side or use the drop downs provided. 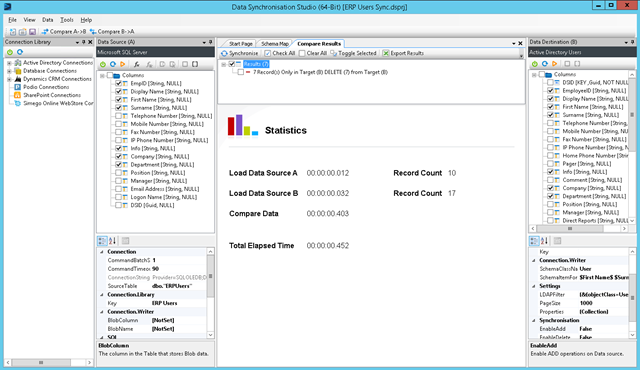 Now we can compare the data in the ERP system to the data in the Active Directory. Click on the Compare A -> B'; button in the task bar to reconcile the two data sources. 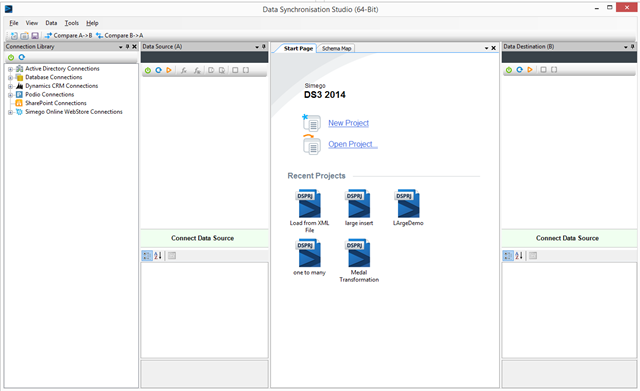 This will reconcile the SQL Database and the Active Directory and give a list of actions to bring the two into Sync. Once complete click the 'Updates' in the tree view. We are seeing a list of deletes because our SQL source is not as complete as our Active Directory target and therefore we would have to delete items in the AD to bring them into sync. DS3 Disables Deletes and Inserts by default but they can be enables if required. Scrolling across you can see the changes that will be made during a sync in yellow. 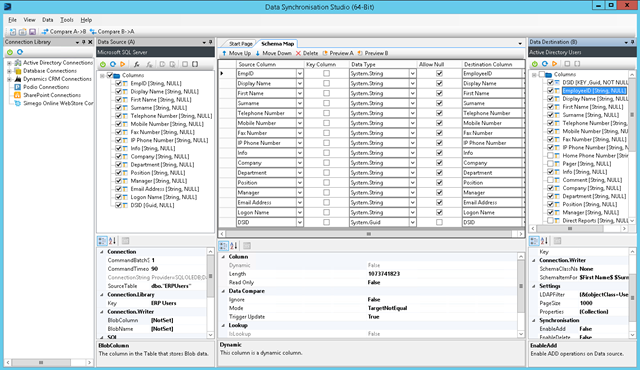 Clicking 'Synchronise' in the tool bar above the Results tree view will show the Synchronise Dialog. Clicking Start will now update the Active Directory with the details from the SQL Table. Once the Synchronise has been completed. You can compare again and there should be no updates to make. The advantage of using DS3 is that you can run this as many time as required as DS3 reconciles the source against the Active Directory first before sending changes, If there are no differences then no updates will be sent.